With a plastic fork I salvaged from breakfast, I scooped the guyabano’s soft pulp gingerly from its delicate skin. Each bite brought back memories of sweat-soaked summers of long ago. I remembered how its sweet juice dribbles down my chin. I remembered how its white flesh flakes off into countless thin wedges with its hard, pointed seeds scattered sparsely throughout. I remembered its spiny skin — firm, leathery, and shiny-green when picked right off the tree, soft and spotted when it ripens. I remembered its creamy taste with notes of citrus and pineapple. It was everything I remembered guyabano to be and rediscovering a childhood favorite in the market that morning was the sweetest thing. 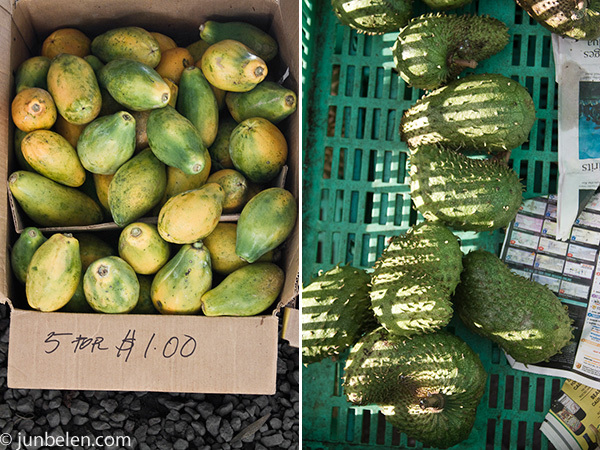 Our visit to the Hilo Farmers’ Market turned out to be a reunion of sorts. My heart raced as soon as I saw those guyabanos, also called soursops. “Hold them gently. They’re very ripe and soft,” the young lady warned me as she handed me the newspaper-wrapped fruit. My mom does the same thing, she wraps them in day-old newspaper to help them ripen more quickly. I also picked up a bag of rambutans still bunched up in their stalks. These are the odd-looking, oblong-shaped, red fruits lavishly covered with soft yellow spines. “How do you eat these again?” Dennis asked with a furrowed brow. He instantly got a kick out of the exotic fruit when I first introduced it to him in our trip to Costa Rica. We were driving from San Jose to Manuel Antonio and saw bananas and rambutans in a roadside fruit stand. We pulled over and treated ourselves to the freshest afternoon pick-me-ups. “Pinch the middle with your two thumbs and then tear it open,” I showed him. “Plop the seed into your mouth and tear the flesh with your teeth.” I adore rambutans but there’s one problem I have with them, I must admit. There is no way to tell if they’re sweet or sour. It’s always hit or miss. And then there were boxes and bins filled with papayas everywhere, both round ones and those slightly longer ones, which are called strawberry papayas. I grew up with papaya trees in our backyard. Tall slender trunks with no branches. My dad would pick ripe ones for breakfast or dessert — sliced in quarters and sprinkled with calamansi juice. He would also pick green ones for my mom’s tinolang manok — chicken stewed in clear ginger broth. 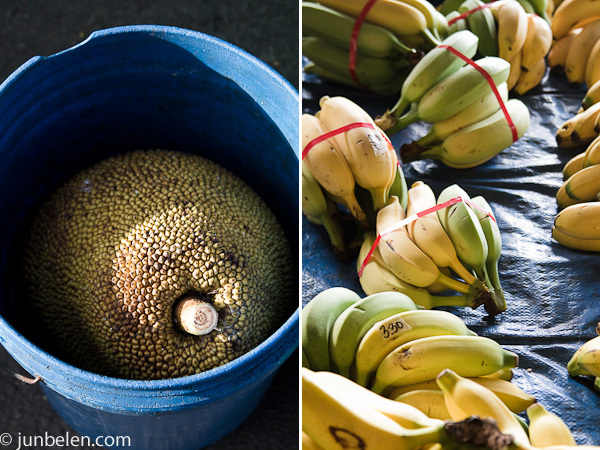 We grabbed Americanos and found a picnic table where we gathered our loot — guyabanos, rambutans, and papayas, spam and hotdog musubis, sweet sticky rice cakes, and a loaf of banana bread freshly baked that morning made with the ripest apple bananas. Everything reminded me of home. What a beautiful way to start the day, I thought. As soon as we were ready to head out and drive to Kilauea, rain started to pour. I guess it’s true when they say that it rains everyday in Hilo. Cut the papaya in half. Scoop out and toss the seeds — there are lots of them! Give its soft, orange flesh a good spritz of calamansi. Add some vanilla yogurt and sprinkle with slivered almonds or crushed macadamia nuts. You can also peel off the skin and slice the fruit into cubes. 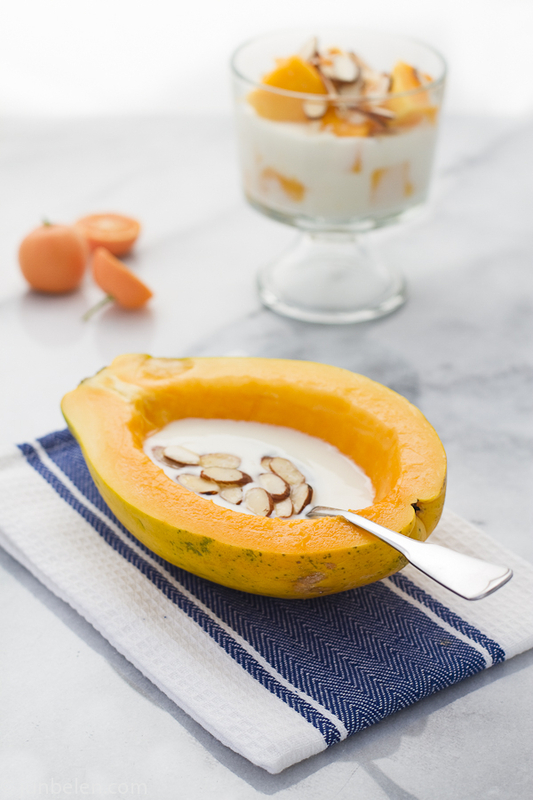 Toss them in a bowl with yogurt and a sprinkle of nuts. Great post. When I was a kid in the Philippines, I didn’t like these fruits at all. 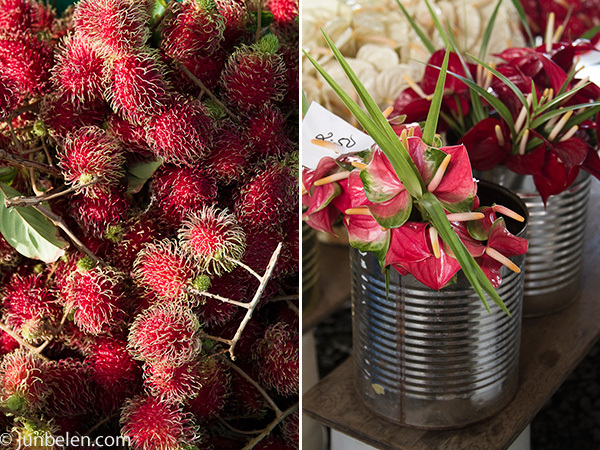 Now that I live in Boston, I find myself craving them, especially the rambutans! I actually do remember now that we sometimes add milk and sugar in papayas just like we do with avocados. Thank you, Bianca! Absence makes the heart grow fonder. Mmmm this reminds me of our old house where we had a rambutan and starfruit tree in our backyard. I used to eat ridiculous amounts since they were just there. Your post is lovely! And that papaya breakfast looks so fresh and inviting. I want some soursop. The ones I saw last Saturday were too hard and too expensive. Blah. My favorite way to eat papayas growing up was always sliced open with a squeeze of fresh lime juice in the center. I love the idea of adding the yogurt in the center, that really does sound like the perfect breakfast! Hawaii has the most amazing fruit. Waking up to that and pure sunshine is true paradise. There are so many fruits here in the Philippines that I am tasting for the first time ever or vaguely remember eating as a child, but I have yet to pick up guyabanos. So thanks for your tweeted recommendation on guyabano smoothies and for this lovely reminder that a simple breakfast of fresh fruit can be such a feast! Such beautiful fruits! Thank you for the virtual tour…. sigh…. It’s so cool how all these exotic (to me) fruits are such a natural part of your life. Anything more than a mango or papaya is alien turf. Great pics, as always. Oh, how I envy you your bounty of fruits! Sounds like a great day at the market, Jun! Sousops are definitely an under-used ingredient, in my opinion, but it looks like you found good use for them. I am absolutely delighted to find you! Don’t know which cave I was living in, to have missed such a space. Following u in Twitter now. These produce reminds me of home in India and our papaya trees. My mom and dad would have ripe papaya for breakfast while i hated it with all my might at that time:) feel so darn nostalgic now.